Confederacy, 1863, 10¢ blue, die B, early state die essay on wove, 25x31mm, engraved by Frederick Halpin, outerlines crude, as well as lines in hair and ear, large margins, rich vibrant color, Extremely Fine; with 2009 P.F. certificate. Scott No. 12E5. C.S.A. Catalog No. 12-DPPa $4,500. THE FINER OF TWO KNOWN EXAMPLES OF THE 1863 10¢ ARCHER & DALY DIE B EARLY STATE DIE ESSAY. 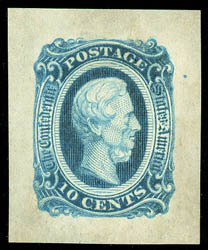 Confederacy, 1863, 10¢ blue, bottom row imprint and plate no. 2 block of 20 with Keatinge & Ball imprints, large margins all around, brownish o.g., some thins and creasing, bottom edge reinforced, Very Fine appearance. 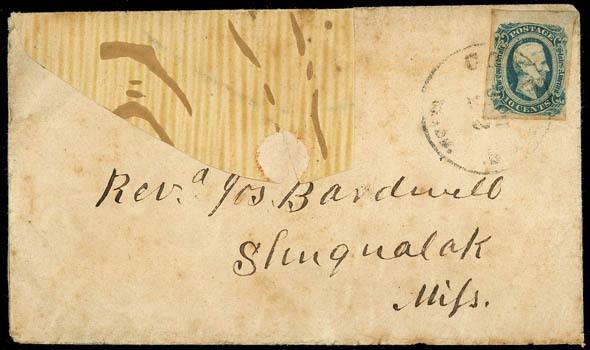 Confederacy, 1863, 10¢ blue, four margins, bright color, tied by "Goodson" straightline postmark (CSA #SL-03C) on buff homemade cover to Drapers Valley Va.; reduced slightly at top, F.-V.F., C.S.A. catalog $1,000. Scott No. 12 Estimate $400 - 600. Confederacy, 1863, 10¢ blue, large even margins, rich color, tied by town cds on orange wallpaper cover to J.W. 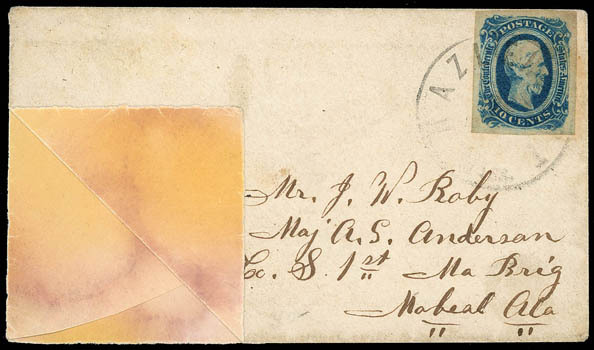 Roby, care Maj. A.S. Anderson, Co. S 1st Ma Brig, Mabeal Ala., Very Fine and attractive. 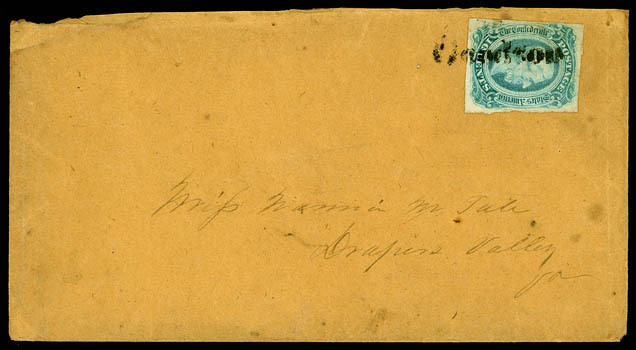 Confederacy, 1863, 10¢ blue, large to ample margins, tied by light strike of "Columbus, Miss" cds on wallpaper cover in shades of tan and brown, to Rev. Dos. Bardswell, Shuqualak, Miss., Very Fine, ex-Katz. Confederacy, 1863, 10¢ blue, huge margins, tied by "Charleston S.C. May 11" cds on orange adversity cover made from illustrated South Carolina Railroad form showing steam locomotive to Bullswamp, Orangeburg Dist. 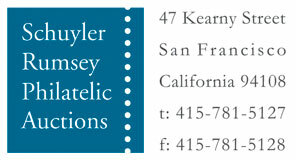 S.C., Very Fine and choice, ex-Kohn. 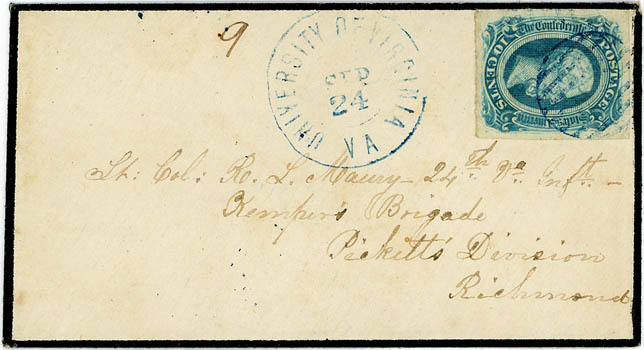 Confederacy, 1863, 10¢ blue, large margins tied by blue grid cancel, matching "University of Virginia, Va., Sep 24" cds on mourning cover with military address to Lt. Col. R.L. Maury -24th Va. 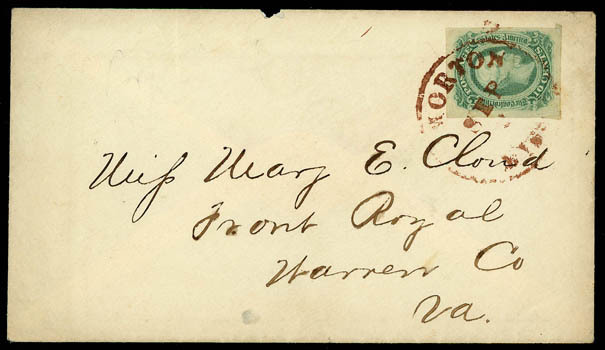 Inft., Kemper's Brigade, Pickett's Division, Richmond, Extremely Fine and choice University of Virginia mourning cover use. 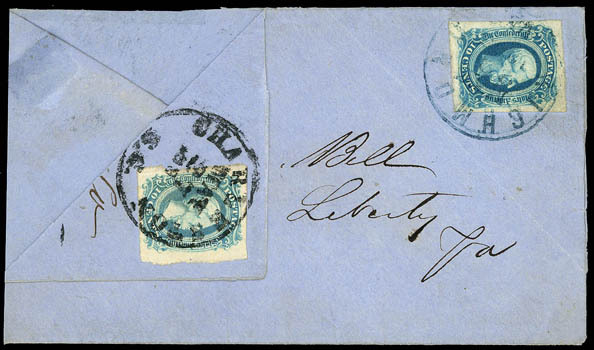 Confederacy, 1863, 10¢ blue, lovely large margins, tied by blue "Richmond, Va., May 28" (1863) cds (Powell type 7b) on blue turned cover to Liberty, Va., inside usage bearing 10¢ blue (11), four large margins, tied by "Charleston, Va., May 27" cds to Richmond Va., Very Fine and attractive forwarding combination. Confederacy, 1863, 10¢ blue, tied by brownish red "Norton, Va. Sep" cds on cover to Front Royal Va.; small top edge nick, Very Fine. Scott No. 12 Estimate $150 - 200. 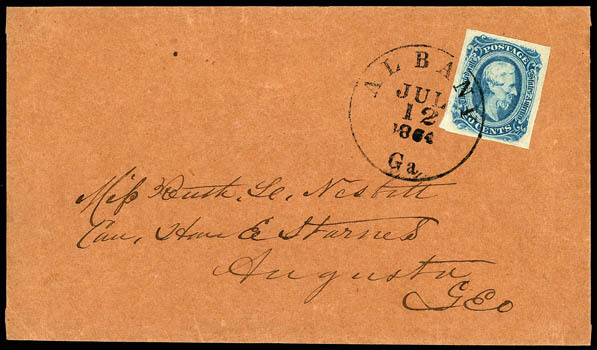 Confederacy, 1863, 10¢ blue, beautifully balanced margins, strong color and impression, tied by sharp "Albany Ga., Jul 12, 1864" cds on brown homemade cover to Augusta Ga., an Extremely Fine gem.